By Francis Barry Silberg For thousands of years, Jews have gathered during Passover to celebrate God's love and protection. This boardbook explains this ancient event in a manner so simple that even the youngest child will understand its historical significance. This board book gives a bare-bones description of the story behind the holiday of Passover. The narration is very simple and appropriate to explain the holiday to toddlers. By Barbara Diamond Goldin Goldin (Just Enough Is Plenty) adapts another story about the prophet Elijah visiting a needy, but still charitable, family and providing their Passover feast. The subtly expressive pen-and-watercolor illustration style, with its large-eyed, solemn- faced figures, is unmistakably Parker's (DeFelice's The Dancing Skeleton, 1989; Preston's Popcorn and Ma Goodness, Caldecott Honor, 1967, o.p.). His palette here is particularly lovely--russet, purple, brown, gray-blue. A fine addition to any collection of traditional Jewish tales, with a final note about Passover, Elijah, and Peretz. Adapting a story by I.L. Peretz, Golden tells the tale of a fantastical stranger, a wondrous magician who appears in the marketplace on a busy day before Passover, and changes the lives of a poor, but faithful couple. Hand-colored etchings throughout. (Step into Reading Books Series) The story of how baby Moses was hidden in a basket of bulrushes and sent floating down the river to protect him from the cruel Pharaoh is retold for beginning readers. The book is physically attractive; there is an appealing and appropriate balance between the illustrations and the text. The full-color watercolor drawings convey a sense of the exotic Egyptian setting. The story is well told within the confines of an extremely limited vocabulary. "Was the baby safe?'' asks the narrator. " `Not yet,' '' answer the snakes, the hippos, and the crocodiles; thus providing a touch of whimsy and humor. The presentation of a Bible story in beginning-to-read format is relatively unique, and this one is sufficiently well done to provide an interesting reading experience. Hidden Passover Objects with English/Hebrew Haggadah A complete Haggadah written in both Hebrew & English. Mixed among the text are Passover pictures with all kinds of Passover objects to find. Passover Fun for Little Hands Simple seder activities and crafts provide hours of fun for little ones. Make mosaics, read the simple picture-story of Passover, and create your own games with full-color playing cards. By Barbara Soloff Levy The meaning of Passover and its place in Jewish culture is explained in this instructive little book. 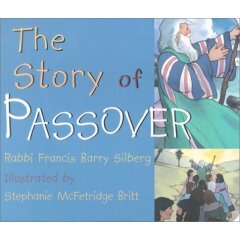 Twelve pages of easy-to-read text and colorful sticker illustrations acquaint youngsters with the Egyptian Pharaoh who held the Hebrews captive, Moses' role in leading his people safely to Israel, and the celebration that commemorates this historical event, including the Seder dinner and foods representing the Passover story. Retold from the Bible Fisher's version of the biblical story of Moses and the Exodus from Egypt suggests a great staged pageant, with richly colored paintings in the artist's signature style. Each double-page spread captures a mythic drama, with the Old Testament figures bold against mountain, desert, and sky, from the hiding of the baby in the bulrushes to the coming of the plagues, the parting of the waters, the wandering in the desert, and the receiving of the Ten Commandments. In one powerful close-up, Moses is horrified to see an Egyptian slave-master beating an Israelite. In another scene, G-d shows his power to Moses in the flames of the burning bush. The text is longer than usual for Fisher, and he combines biblical style and God's thundering cadence ("let My people go!" ) with a plain, sometimes colloquial, telling ("I have made a terrible mistake," Pharaoh says). Of course, this is the Passover story, but it's also the story of the oppressed everywhere and their struggle to be "free at last." The story is familiar, but Fisher's ability with words is matched only by his ability to create pictures. When Moses' mother hides him in the bulrushes, the dark scares the reader as much as it does Miriam, who is watching the baby. The Egyptian princess and her ladies are relieved to find an Israelite woman to nurse the foundling Moses. Their relief shows in their faces. Thunder, lightning, the Red Sea parting for the fleeing Israelites-Fisher is fantastic. A good addition to any home or school library and of particular interest to those who have just learned the story and who can relate it to Passover and the Ten Commandments. by Menucha Fuchs The Children's Learning Series is designed to encourage young readers. Packed with amusing, yet educational, stories in clear and concise language, these books not only teach children to enjoy reading but also show them the beauty of performing mitzvos and helping family, friends and neighbors. Show your children the beauty and joy of Pesach in Pesach with the Cohen Family. For boys and girls ages five through eight, kindergarten through grade three. By June and Terry Behrens The Adler family prepares for the Passover holiday, and readers follow them to the Seder meal and a simple retelling of the Passover story. This very attractive book, with large, clear type and many color photos, will attract young children. They will learn much about the customs and traditions of this important Jewish holiday. By Miriam Nerlove Intended for the very young, Passover is an introduction to this traditional Jewish holiday, told in rhyming verses. Full-color illustrations enhance the lively rhymes. Grandma's Seder Plate is Missing! : A Passover Special From the makers of the original Mendy and the Golem, comes a Passover comic book. This 32 page, full-color bound softcover book is sure to make this Passover an exciting one. The story revolves around Mendy and Rivkie Klein and their adventures when they discover that the Klutz family will be visiting for Passover! The book is sure to inspire children and adults and is the perfect compliment for the Seder. We are receiving extensive media coverage for the first ever, full-featured Jewish comic book. By Bobbi Katz Warm, detailed illustrations and a sturdy board book enhance this easy-to-understand retelling of the story of the Jews' fight for freedom and Exodus from ancient Egypt.